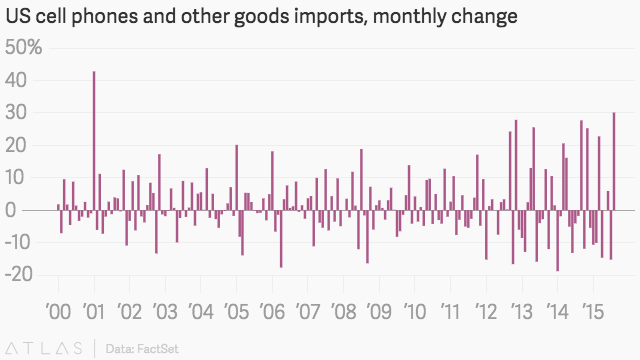 Americans are calling for a larger trade deficit—literally. August trade data (pdf) from the US Commerce Department shows that the difference between imports and exports surged 15% from July to $48 billion. One cateogory that’s leading the expansion is “cell phones and other household goods,” which rose $2.1 billion, or 30%, from the previous month, for the category’s biggest monthly gain since 2001. Economists are more or less attributing the jump to Apple’s new iPhone 6s, which has been selling at a record pace. “This one-off effect contributed to the $4.0 billion rise in imports of consumer goods,” Wells Fargo wrote in a note to clients. That said, there was some cause for concern in the August numbers overall. 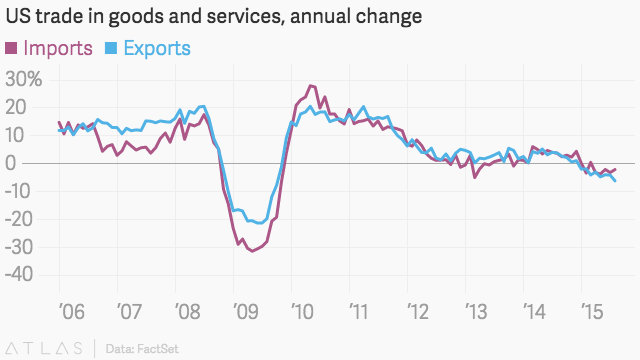 Both imports and exports continue to sink on a year-over-year basis, and a strong dollar isn’t helping the latter.